During the 3.3-year alternate weekend Wilfrid Laurier part-time MBA, students will complete a general MBA and one of nine specialization fields. Like all Laurier MBA candidates, Toronto students will also take part in a Not-for-Profit Practicum. Students will choose between a 40-hour practicum with a local organization or an extended international project. Classes begin in early April of each year. Students spend ten terms over 3.3 years earning their MBA. The first 4 terms are spent covering the “integrated core” and the following six are spent alternating between electives and special projects. Classes are scheduled alternating weekends starting Friday 7-9:30 p.m., Saturday 8:15 a.m.-5:15 p.m. There are no classes during July and August. If students also pursue a CPA Designation with their MBA, it will push the total time from 3.3 years to four years or 11 terms. The first four terms still cover the integrated core courses. The next seven terms cover specific CPA courses like Taxation and Advanced Corporate Finance. The final term will include the two-part capstone course. If applicants choose to add a Master of Finance, they require an additional 12 credit courses on top of what’s required for the MBA degree. This will take around four years or 11 terms. The first four terms still cover the integrated core courses. Terms 5-10 will include the entire Master of Finance course load. Term eleven and twelve include one elective each and an applied business research project and the Not-for-Profit Practicum. The total cost of the part-time program is about $53,650 CAD for 10 terms, or $5,365 per term. The MBA with CPA program costs a total of $73,300 costing about $5,865 per term for twelve terms. The Accelerated MBA program costs a total of $34,600 CAD at about $5,765 per term for seven terms. Requirements for the Wilfrid Laurier part-time MBA program are: a four-year undergraduate degree or equivalent with a minimum of B standing in the final year of study; GMAT scores are mandatory for anyone who completed their degree outside of Canada; a GMAT score of 550 or evidence of strong quantitative skills; one academic and two professional letters of reference or three professional references; TOEFL minimum score of 600 (paper based) or 100 (internet based); at least two years of full-time work experience; and a completed application form. Classes begin in early April. 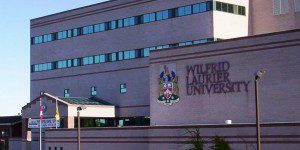 The application deadline for the Wilfrid Laurier part-time MBA program is February 1 of each year for domestic students. For international candidates, the application must be received by January 15 of each year. Admissions are rolling and offers are awarded year-round for the upcoming intake date.